Economic inequality has been a popular topic for analysis, commentary, and political debate over the last several years, lately even garnering attention from the Pope. Recent data have elicited yet more concern. The top 1 percent of wealthy individuals in the world now own more than the next 99 percent combined; the top 0.1 percent own more than the bottom 90 percent. 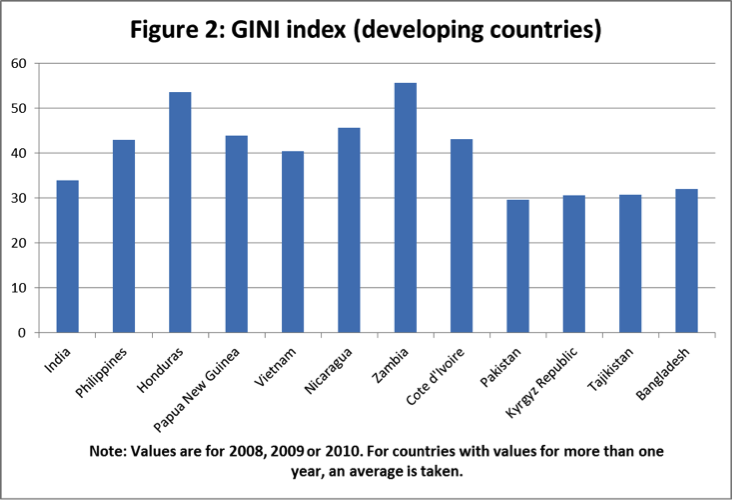 When examining inequality on the country level, the GINI index reveals that those countries with high income inequality are not only advanced economies but also resource-dependent laggards. 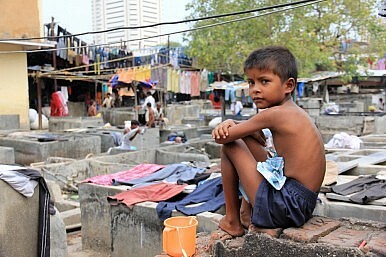 For India, growing wealth inequality limits efforts to overcome poverty and reach full development. This challenge necessitates the type of fundamental structural change that can only originate politically from the ground-up. The latest World Bank GINI data for India is from 2009. 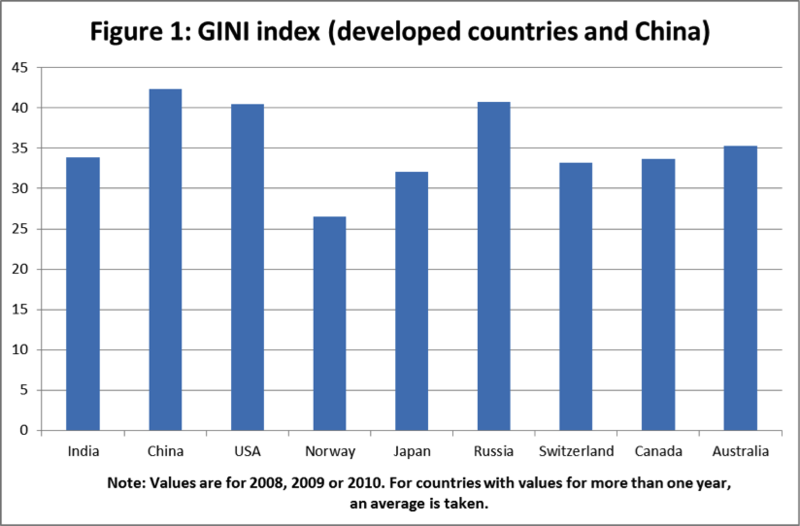 Figure 1 compares India’s score (higher = more unequal) with that of several major world economies, using 2008-2010 data. In this group, India is not an outlier. For the exception of China, however, the comparator countries are much wealthier, and in a highly developed capitalist context some inequality can be expected. As a developing country, India is not in good company. Furthermore, other measures indicate that India’s income inequality (measured by consumption) has risen since the 1990s. As a country’s capital base grows through free-market and wealth-building institutions, the gains of growth flow upwards and disproportionately benefit the already-rich. Therefore, inequality should be measured as a function of not only income but also wealth, and the income-based data above tell only part of the story. For example, India’s wealth inequality is much higher than China’s (GINI [x100] of 66 to 55). In 2012, wealth held by billionaires accounted for nearly 10 percent of national income, roughly equal to that in the United States and Mexico and double that of Brazil and China. Before the financial crisis, this share was as high as 22 percent. Is it headed back? The ills of inequality are well documented. Even in developed countries such as the United States, inequality has been linked to social problems including higher infant mortality rates, shorter life expectancy, and widening student achievement gaps. The structural forces behind inequality are also well known and affect most countries. In addition to continuing globalization and technological change, there are three factors intensifying India’s inequality problem: population growth and migration, the success of a tiny elite, and lack of political will. First, India’s fertility rate is higher among lower-income and uneducated rural populations than higher-income populations. Having more children makes sense in agrarian economies, but not all those born in rural areas stay. India’s cities represent opportunity (and challenges) for the next generation of young Indians. The legacy culture of large rural families is inconsistent with the needs of urban economies and fuels migratory waves – educated or otherwise – that cities and their formal job markets cannot accommodate. There are simply too many people, and the resulting unemployment and underemployment exacerbate the inequality gap. Second, India’s high-income population enjoys better opportunities, and its top talent can compete with the world’s best (many leave to do so). Numerous Indian CEOs represent a growing elite class, and those who remain in the country are handsomely compensated. Such success can inspire young Indians, but in excess it exacerbates inequality. According to one analyst, CEO compensation in is higher in India than the United States, when measuring by dollar of revenue. India also has the world’s third highest number of billionaires (97), and even a handful of lavishly compensated executives can impact Gini coefficients. This pattern of high compensation for executive-level jobs has cumulative social and political effects. Further, the mechanisms for compounding wealth (e.g. property and securities) are largely unavailable to struggling middle and low-income groups. Finally, decades of political influence have balanced the economic scales towards the wealthy. Public policies can impact the distribution of wealth, but in India redistributive efforts have not gone very far; the current political regime offers little hope for improvement. The benefits of entering the globalized economy are often over-optimistically conflated with the virtues of unfettered capitalism. For example, the Trans-Pacific Partnership will create opportunities for some Asian businesses to expand their markets in the United States (the agreement is expected to boost Vietnam’s GDP 11 percent by 2025), but structural adjustments to a changing regional competitive landscape will also undoubtedly displace workers and eliminate jobs. For India the impacts of the TPP are uncertain; the benefits of regional economic integration may “trickle down” to India’s lower-income workers in small ways, providing additional job opportunities and more work hours. However, this does little to close the wealth gap, as these wages fail to provide the disposable income needed for investment. The only hope to keep India’s top 1 percent from running away with the country’s economic gains is for lower and middle-income workers to organize and demand more distributive policies. However, this would only address the symptoms; it does little to cure the structural determinants of inequality. In addition to such policies, India needs to control population growth, close educational achievement gaps, and establish a durable and defensible competitive advantage. India is projected to have the world’s largest population by 2028, but regional competitors can spoil its economic prospects and livelihoods – such as they are – by mimicking its growth model, improving education, and expanding knowledge industry capacity at equal or lower wages. Beyond regional competitiveness, India should examine its collective soul to ask whether an economy by and for the obscenely wealthy is just. The inability to establish a political consensus on the extent of redistribution is a convenient excuse for ideological purists to abandon redistributive policies altogether. However, there is a line beyond which inequality is too high, and India is close to – if not already beyond – that line. “Who decides how much inequality is unacceptable?” is no longer an excuse for inaction. Despite expectations of a slowdown, India posts a surprisingly high GDP growth rate for Q4 2016. Indian Central Bank Lowers Rates, Citing Sluggish Global Economic ConditionsMeet India's Next Central Bank ChiefPolitics Over Performance: Indian Central Banker Raghuram Rajan Won't Seek Second TermIndia Takes Over From China as Top Global FDI Destination in 2015Can India Reproduce the 'East Asian Miracle'?